Every Wednesday (since September) I leave work early (around 1 p.m.) to take the D train uptown to The Bronx. Thirty to forty minutes later, I get off at Fordham Road station and I'm ready to RUN. My sprint begins on the Grand Concourse, all the way down Fordham Road and ends passed Fordham University. 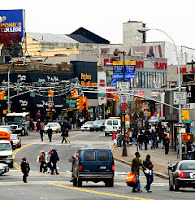 For those not familiar with The Bronx, Fordham Road, is a long downhill (or uphill) busy stretch of street with stores, street vendors, shoppers, baby strollers, shopping carts, school kids, solicitors and the occassional undesirable. By 2 p.m., I pick up The Boy at school and then walk the three blocks to the bus stop. Depending on the weather, my mood or amount of the time we're waiting - we can take the BX 9 or BX 22. Either one we take, we'll still need to transfer to another bus - the BX 10. The buses at this time of day are packed with school kids, mothers, babies, elderly folks and other people going about their day. Sometimes we get a seat. Sometimes we don't and I have to balance myself and The Boy on a crowded bus. At some point during our trip, we'll get off somewhere, I'll grab a cup of coffee for myself and a snack for The Boy. Our occupational therapy at the sensory gym is at 4 p.m. We usually arrive by 3:30 and we sit in the waiting room and wait. The Boy's session is 2 hours so I make myself comfortable until The Husband picks me up at 6. We're home by 7 and then I need to cook something quick, eat and get The Boy ready for bed. Last Wednesday I did something I have never done. I cancelled our session. No, he wasn't sick. No, neither was I - not really. It was raining and cold and I was simply exhausted. During the train ride up to The Boy's school, I couldn't keep my eyes open. Everything hurt. And my body kept jerking itself awake. All I wanted to do was go home, flop on my sofa and sleep. The thought of standing in the cold rain, waiting for two buses made my head ache. So I cancelled. I'm not the parent that casually cancels sessions. I don't do it unless The Boy is sick. I've traveled to sensory gym during snow storms and heavy rains and on much colder days. So I hated myself for doing it last week, especially when The Boy started asking for it. I had broken out routine. And I had to explain to him that Mommy was sick. Promising him cookies seemed to work. And the session was soon forgotten. But its days later and I'm still feeling the guilt of it. Because guilt is inevitable. It comes with the territory of being a mother. There are layers of it. As a working mother - who is also in graduate school - I have an extra layer. And as the mother of a child with autism, an extra two to three layers are added on top of that. Am I spending enough time with The Boy? Why haven't I started the GFCF diet again? Why don't I schedule more playdates? Maybe I should try _______ therapy? Aquatic? Equine? Take your pick or choose from any of these here. Obviously, I know that missing one OT session isn't going to make or break The Boy. And I know that not every single moment of our lives can be made into a lesson, session or life changing moment. I try to remind myself that I am doing the best I can and that sometimes, when my body is tired - I have to let it rest. Otherwise I'll be useless. But still, this is easier written than believed. I'm sure that many of your readers will relate to your feelings. I think that the most important thing that you can do for your son is to keep yourself mentally and physically strong. If you need to take a break now and then, do so. And, don't feel guilty over it. Going 180 mph and wearing yourself out will do no one any good in the long run. You are human and can only do so much. Prioritize what is most important, celebrate all that you do for your son (which is a huge amount)! and don't worry about what you just cannot do. I agree with Yuji. You son needs a mama that takes time for herself as well. If you don't your going to snap! Not at him, maybe not at your hubby but something somewhere deep inside of you will break. We aren't made to go through that. Don't make yourself a P.O.W. The boy needs a mama who is not stressed - I know easy to say not easy to do. Lay off the guilt and promise yourself a week in the future to just relax. One week of walking around parks, zoos, reading books and cuddling - No heavy schedules, no appointments - Just one stress free week. I'm familiar with the area and that alone is stress in itself. It's okay to break routine once in a while you were tired and needed a break. Guilt is something we all feel especially working mothers. I've always felt it there are times where I feel guilt and overwhelmed due to the fact that I work full time and feel that I'd probably be less stressed if I work less hours or was home period especially when EI doesn't get it that there are working moms and therapists don't want to accommodate after 5 pm. Wow, I know just how long that walk is down Fordham Road, and then you have to take *two* buses after that? After having spent 40 minutes on the D train? And you do it every week? Of course you needed a break! Don't beat yourself up. 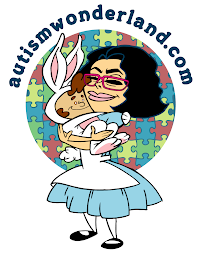 Everyone needs time to rest, including autistic kids and their mothers.